Let's take a look at some gorgeous bridal handbags option. A gorgeous wedding accessory to add personality and individuality any look, also because even a bride needs something to carry those few bits and bobs on the most important day of her life! Take a look at our choice of best handbags for a wedding. 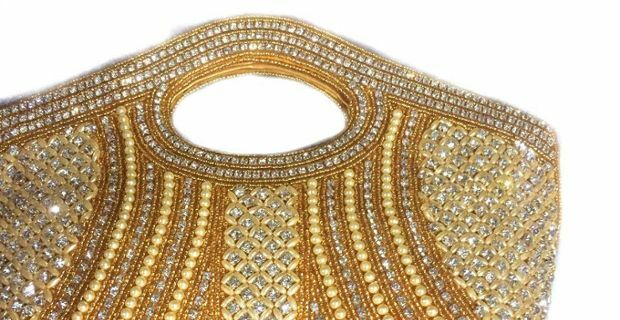 Obviously you need something to complete the dress or outfit, in this post we will look at some lovely handbags that would look great with many different version of the traditional white gown. A popular choice is the classic satin clutch in that beloved, warm shade of white that is ivory. You can't go wrong, this is the simplest choice if you are wearing an ivory wedding dress and don't want to add anything too elaborated. Plus, you will be able to wear this versatile clutch on other occasions. Choose one with a concealed chain for extra practicality. We found, for instance, a gorgeous pink blush bridal clutch decorated with satin flowers and rhinestone, handmade by Camilla Christine, £148.73, and a lovely 1950s vintage ivory and gold box clutch in satin, metal, leatherette for £49.99. Have you been invited to a wedding? Why not take a look at our short guide on Wedding dresses for guests?